Home > Books, News & Views	> Can doubts about the shroud strengthen Christian faith? Can doubts about the shroud strengthen Christian faith? A reader sent me 1) a question, 2) a link to a Huffington Post article and 3) a Kindle book as a gift. First the gift. 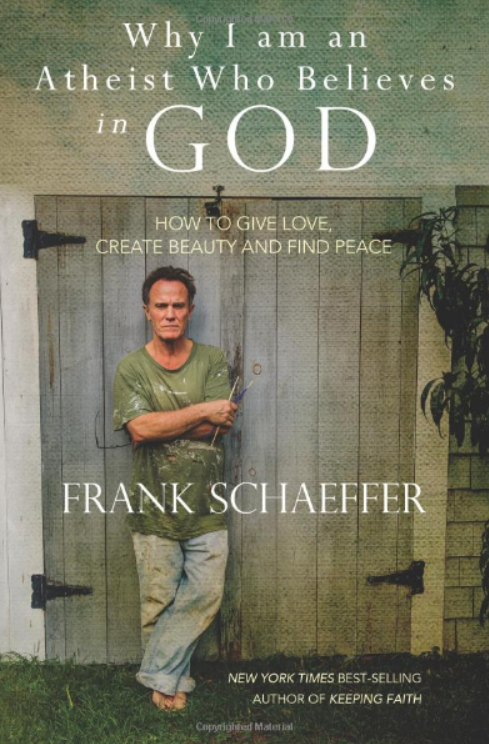 It is Frank Schaeffer’s newest book, Why I am an Atheist Who Believes in God. Yes, the gift will get your question published in the blog. I’d have published it anyway. Thanks. I may even read the book. It sounds interesting. To millions of evangelical Christians, the Schaeffer name is royal, and Frank is the reluctant, wayward, traitorous prince. His crime is not financial profligacy, like some pastors’ sons, but turning his back on Christian conservatives.
. . . I’ve never met an unequivocal atheist or religious believer. I’ve only met people of two, three or four or more minds–people just like me. Atheists sometimes pray and eloquent preachers secretly harbor doubts. The evangelist Billy Graham preached certain salvation and heaven guaranteed yet privately told my dad, a friend and fellow evangelist, that he feared death and had many doubts. Muslim, Jew, Hindu or Christian, you are that because of where and when you were born. If you are an atheist, you are that because of a book or two you read, or who your parents were and the century in which you were born. Don’t delude yourself: there are no good reasons for anything, just circumstances. Don’t delude yourself: you may describe yourself to others by claiming a label of atheist, Jew, evangelical, gay or straight but you know that you are really lots more complicated than that, a gene-driven primate and something more. Want to be sure you have THE TRUTH about yourself and want to be consistent to that truth? Then prepare to go mad. Or prepare to turn off your brain and cling to some form or other of fundamentalism, be that religious or secular. How much is study of the Shroud of Turin about dealing with our own uncertainties? I know you say your faith came first. You tell us that if the shroud were disproven, it wouldn’t change your faith. Are you sure? I am a cradle Episcopalian. That much of Schaeffer’s thesis I must agree with. I’ve always had faith and I’ve always had my share of doubts. I like the integration of my fascination in the shroud with my faith. But one does not depend on the other, at least not too much so. But doubt can be a good thing with Christian faith and in the study of the shroud. It seems at times that doubts about this or that having to do with the shroud strengthens my Christian faith. And maybe it’s the other way around as well. Thanks for the book and making me think about this question. The question is: What us doubt? What standard do we apply? What is faith? I have been having correspondence with someone who is from the fundamentalist community who doesn’t need to be identified. “I am making one change in my Introduction. I am going “can” reference to fundamentalists and stick with what to me is a pejorative “young earthers.” Where I draw the line is on the 6,000 year claim. One can be a Fundamentalist without that literal interpretation. Even St. Augustine spoke of the creation of the Earth not being a matter of “days” as we interpret the word. “I draw of line of complete exculpation of young earthers because the Shroud is as much a matter of science as it is faith. It is in my view a joyous harmonization of these two “disciplines.” The problem with young earthers is that they eschew science and frankly, we can’t do that. My current chapter is the penultimate 17 (18 will be the last). 17 is the Apocalypse of Selfishness. “We are living in a truly apocalyptic times where the entire extinction of humanity is not a question of biblical exegesis but of scientific fact. As I state in the Introduction, science can be Christs or Anti-Christ. To the “young earthers” science is nothing but a metaphorical anti-Christ. That’s too bad, because we need science to help deliver us from the selfishness that crucified Christ and he redeemed us from. It is hard to know where the middle ground is. On one hand no one wants to be described as “anti-science.” Yet I am smart enough to know that science is often agenda driven and heavily influenced by money, politics and the world view of those doing the science. Once something has become dogma in the scientific world, try getting a peer reviewed journal article published that espouses a contrary view. Science can be just as dogmatic as any religion. While I don’t describe myself as a “young earther”, I also hold great skepticism towards science models that hold to a godless evolutionary view where all can be explained by random chance and natural selection. Within academia, to even mention Intelligent Design is tantamount to treason and heresy. Yet the principle of ID is clearly taught in Scripture….”The heavens declare the glory of God and the firmament reveals his handiwork.” God is first and foremost the Creator. Secular science wants to strip Him of this glory by attributing everything to natural causes. I don’t buy it. Until the day I die and meet my maker, no one will convince me a process that by definition is unguided, undirected, with no plan and no purpose can result in a universe and a world characterized by complexity, order and design (“apparent design” for the evolutionist). I see Intelligent Design all around me but that is because I choose to see it. Jesus has much to say about the Pharisees of his day who had eyes but could not see. Science often promotes its own form of spiritual blindness. From the beginning of humanity, science and religion have always been entwined. Sometimes the results were no so good. It would be difficult I believe to draw a line between science and religion in the Maya civilization, so too I expect in ancient Egypt. Where we are facing disaster today is the tendency to reject science by a large portion of the population. It’s not just evolution some of who’s most prominent scholars are also Christian. Witness Teilhard de Chardin in the last century and Elizabeth Johnson in this century. The problem is that the overwhelming number of scientists now believe that we are reaching a near irreversible point of climate change that is already producing extinction of some species and presages the possible extinction of our own. Your are right about science being subject to corruption. I would think that we should have all scientists reveal the sources of their income. I would say it’s a good bet that the narrow minority that reject climate change may be funded at least in part by carbon energy giants such as Exxon. And then there are the Koch brothers who fund ant-climate change political candidates many of whom spout nonsense. Their business is pure carbon – coal. My personal answer: No doubt about that. And I go far beyond that by saying that if one day, it would be proven that the whole Jesus story was a complete creation of some men from the 1st Century, that wouldn’t change my faith at all in the loving and merciful God revealed in this story. In other words, even if the whole Jesus story was a creation (this is not of course, but let’s assume it is for a moment), I would still believe the “God of Jesus” (i.e. the Father) is real and true! If I can say this with so much confidence, it is mainly because of 2 spiritual experiences of the Father I had in my life, which convinced me that God is Mercy and Love and nothing else, which is exactly what the whole Passion of Jesus wanted to reveal. Yannick, Best thing you’ve said in this blog so far.